South Park is the oldest public space in San Francisco, built in 1852. Originally an English picturesque strolling park, it fell into disrepair and was been subject to ah-hoc improvements over the years. The South Park Improvement Association hired Fletcher Studio to work with the neighbors and community leaders to develop a master plan for the park. The new design may be described as a contemporary interpretation of the picturesque. It provides multiple amenities, arrayed along a meandering programmatic pathway. It also helps to alleviate two major issues including poor drainage and slopes that exceed ADA limits. The new park includes a custom play area and structure, stages for performance, a large open meadow, and plazas of varying scales. Infrastructural improvements include bulb-outs and chicanes for traffic calming, bio-infiltration swales and flow through planters, and a rainwater cistern for irrigation usage. The initial design for the park was developed through an initial iterative analog diagramming, that was then replicated and expanded upon with the use of parametric software. Systematic urban analysis was performed on the site, evaluating land use, park usage, circulation patterns, tree conditions and drainage systems. To resolve these interrelated variables, the design team utilized four material systems: an expandable, modular paving system; large sloping meadows; vegetated infiltration basins; and low retaining walls to mediate between paving and planted areas. Site research was also conducted, on multiple days and at different times, to determine both points of entry and desire lines. These points and movement vectors were then mapped and the final design resulted from their interpretation. The points were connected with a central pathway that thickens to support programs and amenities. The design process then proceeded through a hybrid of analog and digital techniques. Utilizing a combination of blend tools, manual adjustments and hand drawings, allowed for idiosyncratic moments while conforming to a robust formal rule set based on environmental, spatial, and material logic. Corrections and adjustments to the design were always performed by hand drawn overlays. Physical models were created to develop the paving patterns, wall profiles. The resulting design includes a series of long walls that follow grade and flow through the park, to define spaces, hold grade, and to provide seating and protection from the adjacent streets. The pathway system system employed, which consists of “tablet” shaped pavers, with rounded edges that are arrayed on the north/south axis throughout the park. The tectonic system for the paths and walls, consists of a simply constructed combination of easily modified components that would allow for a diversity of spatial, programmatic, and topographic solutions. The combination of these two elements allows for a coherent modulation in the width of the path responding to contextual/external spatial desires, and fine-grain adjustment of vertical and horizontal edge, to responds to site-specific conditions. Both the pathway and wall systems were simple geometric parameters, that could be input into parametric modeling in future phases of design and construction documentation. The primary determining factors of the formal design decisions were driven by a hierarchy of circulation patterns, access points, social nodes, existing trees and structures to remain. By linking these points with a single path the design forms a consistent linear promenade along the length of the park while allowing for lateral crossings across the park. Major and minor plazas are formed at key junctures through the thickening and thinning of the path to accommodate anticipated programs. In the initial design phase, these decisions were made through intuitive understanding of the parameters of the site and embedded in an analog rule set that guided design decisions. In further research we have codified the relationship between the spatial logics of the design and the material logics of the tectonic, in a parametric algorithm. Initial research was performed in preparation for the Acadia 2014 exhibition, an annual parametric design conference. The central question was could the design process, the distribution of points and pathways with a distinct tectonic, be replicated? Further, could other contextual influences and conditions be added, and could the tectonic respond to those conditions? Is the use of responsive parametric definitions scalable, can it be applied to larger linear landscapes such as waterfronts, urbanized rivers, etc? Grasshopper, a parametric plugin for the 3-D modeling program Rhinoceros, was used to further develop the research. By implementing the design variables into a parametric system we intended to utilize the system to display the design resiliency of the tectonic and spatial systems. The decision to codify the analog system, developed in the initial phase of design, was driven by the knowledge that future specification of the design in permitting, coordination, and construction documentation would require multiple iterations responding to new constraints and conditions, as they might arise. In the model, a straight line was drawn down the center of the site. A field of weighted attractors were positioned that corresponded building density, land use, and to points of site entry. Each attractor was assigned a different weight (force), on a scale of 1-10, a mid-block entry point might be assigned a 5 while a corner or intersection would be a 10. These individual attractors then deformed the central line, thus modifying it in response to their needs. Then a variety of other factors we introduced to modify this line and to make it spatial. The line was then converted into the tablet paving tectonic, so that the spatial distribution of the module was established. Then repellers were inserted to confine the paving distribution in places where it might conflict with the preservation of existing trees or structures to remain. Finally, the perimeter of the park was established as an absolute boundary, and served to trim the paver distribution. The use of the parametric software is especially suited to develop multiple design solution, that utilize a coded system, and that react to embedded parameters and produces a continuous form in resolving these conflicting constraints. This promising application to sites and to larger scale linear spaces deserved further study. In response to the observed resiliency of the rule set we foresee the application of this system to larger scale linear open spaces. It has the potential to resolve overlapping two dimensional and three dimensional jurisdictions, circulation patterns, implementation phases and dynamic processes through a continuous morphologic operation. Potential sites for this application include: urban waterways, water fronts, corridors, linear open spaces, and rights-of-way. Many of the same components learned in the Acadia research process were employed in the design development. Grasshopper was further used, to produce the technical documentation for project construction and permitting. A responsive 3-D model was prepared, that integrated the site data including existing utilities and topography. This model was responsive, in the sense that modifications to simple referenced forms, would result in universal modifications throughout the master project model. For example, the site walls referenced a single wall profile section drawing. This profile could be modified, the radius, batter, thickness, height, etc. The modification of the profile would then automatically apply to the entire park, hundreds of linear feet of walls. Updates to wall profiles, thickness, edge radii and even the distribution and frequency of skateboard deterrents. Paving tablet width, length, and distribution could be adjusted easily, allowing the entry of exact values, or perhaps more intuitive sculpting of vectors. Walls served s trimming forces, and the distribution of the paving field was essentially a simple vector outline that Grasshopper would convert into the modular tablet paver field. This allowed for the clean export of vectors to 2-D CAD with minimal trimming and cleanup. 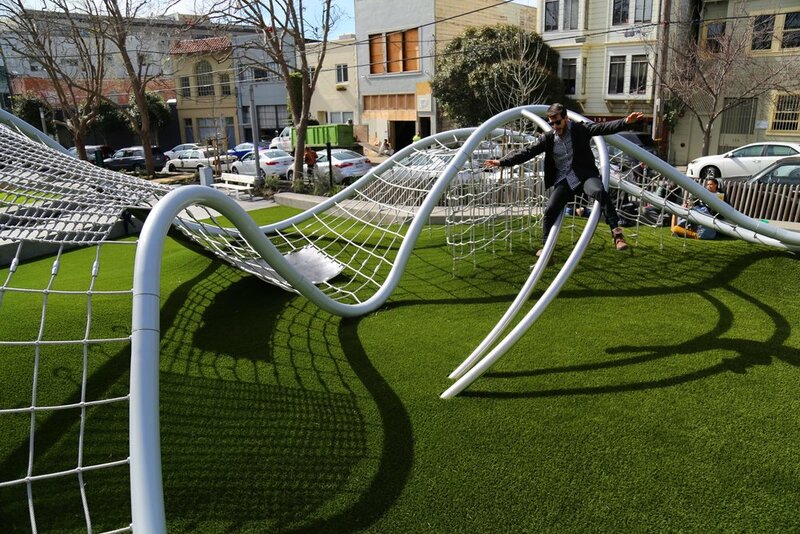 With over 18 feet of grade change on the site, and tight tolerances to achieve and accessible public space, Grasshopper again proved to be a powerful ally. Accurate elevation points from the civil engineer were input into grasshopper to generate a topo mesh. Civil modifications to the topography could be checked against the master model for errors or adjustments needed. Drainage invert elevational points could be connected to each other, with the resulting vectors converted into tubes so that the drainage system could be evaluated in model form. Grading and drainage updates from the Civil team would then be easily input, and new 3-D models of surfaces and drainage infrastructures were automatically generated. The custom play structure and its groundplane, were developed with a similar sequence, analog/ hybrid digital/ and finally parametric modeling. Modeling wire sheathed in vinyl tubing was inserted into holes that were lasercut into a large pinboard. This allowed the team to iterate multiple routing solutions, which could be documented and lead to the digital modeling. Grasshopper then used to generate a responsive model for the custom play structure. Like the analog pinboard, this model allowed us to quickly generate multiple versions of the structure. The model would automatically distribute netting, fittings, and play elements, responding to the manipulation of the perimeter and interior tube forms. Running component lists could be generated and output to spreadsheets for cost control and evaluation. Final visualizations of the various iterations could be generated at any time, for community design meetings. The design of South Park began with ideas, concepts, and impulses which are informed by public process, context, and the many site influences and variables. It is the designers role to sort through the variables and rules and to pursue a path that leads to a final design proposal. This process, and the design itself, is enhanced with the use of parametric definitions, rule sets, and algorithms. These emerging tools allow of the development of an expanded spectrum of possibilities, beyond what might be typically achieved with pen and paper. It also can often lead to unanticipated outcomes. A parametric program can allow for the generation of infinite iterations, some of which may never have been conceived. At times, mistakes made in data entry, can lead at designer onto a new path of exploration. Yet it is still up to the designer, to make the final call in selecting what is worth further developing. Great design often comes from challenging rules and conventions, from responding to insurmountable constraints with solutions. It also comes from human intellect and experience. Memory, experience, emotion, and humor are not yet parameters that can be input into a parametric definition.